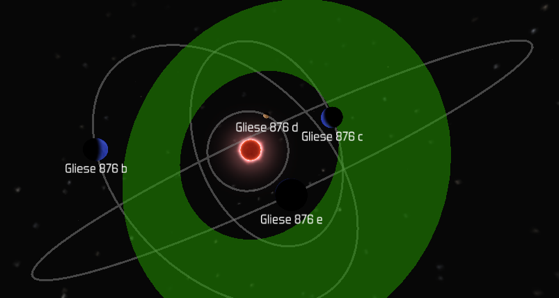 This is a COMSIM of the recently discovered planetary system, Gliese (GLEE-ZUH) 876, a red, type-M star with some similarities to the Sun (type-G), 15 light-years away, with three planets in orbit around it. It was discovered by the Kepler Mission Space Telescope. As can be seen, planets do not necessarily orbit their host stars in an orbital plane, perpendicular to the star's axis of rotation, in the way that the planets of our solar system do. This came as a bit of a surprise to me when I found out that a high percentage of exo-planetary systems actually exhibited this arrangement (I don't have that figure with me at the moment). Illustration of the Gliese 876 Planetary System. The green disk represents the extent of the habitable zone (popularly referred to as the 'Goldilocks Zone'), of Gliese 876, in which, two planets, "876 b" and "876 d", partially occupied, in eccentric orbits, relative to each other. The zone is shown at an angle perpendicular to Gliese 876's axis of rotation. The parent (host) star of this system, Gliese 876, is an 11th magnitude star. This means that, although the system is 87,000,000,000,000 (87 trillion) miles away - it can actually be seen in a medium-sized (6" aperture) telescope. Take a look!